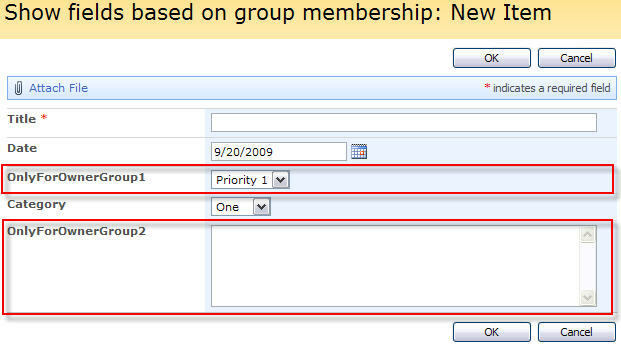 This article describes how to show or hide a form field based upon membership or not membership in a SharePoint group. This solution uses the script created in this article to access the user info on the current user. It is a precondition that you read the previous article before continuing with this one. I use some code (”interaction.js” and stringBuffer.js”) created by Erucy and published on codeplex. The file “AccessUserProfileInWSS.js” is created in the previous article. * userId : Only supplied if the user to query is not the logged in user. * returnGroupName (true) : Returns the groupName of the group if the user is in it – returns false if user is not in the group. * returnGroupName (false) : Returns "true" or "false"
Save this as a text file and rename to “IsUserInGroup.js”, then upload to the library as shown above. The variable “arrToShowOnlyForOwnerGroup” is an array of “FieldInternalNames” of the fields to hide for “non owners”. Look here for a quick guide for obtaining the “FieldInternalName” of your fields. Just remember not to set the field as required from SharePoint UI – if the user cannot see the field he can not fill it! To learn how to add dynamic required fields – se fieldutility.js from Erucy on codeplex. I have been able to hide some fields in my forms successfully based on membership. How would I go about using similar code to make the fields read only based on membership? Figured out how to disable fields based on membership. with a line that disabled the field, based on information that I found on the jQuery site. If you disable the field the value in that field will be cleared when you save the list item. To make a field read-only i would recommend you to take a look at the file “fieldutility.js” from Erucy’s Codeplex page. When I log in as an administrator (Group = 5) then the table appears correctly. However, when I log in as someone with “Read Only” access, the user name and password prompt appears 4 times. If I select “OK” 4 times, then I can eventually access the site. The HTML table is then hidden. Do you have any suggestions why the login prompt keeps reappearing for someone with “Read Only” access? This may have to do with them not having permission to browse the “user information list”, but I’m not sure. Can you check the permission level for the “reader” if the “Browse User Information – View information about users of the Web site.” is checked? Also you can try to alert the “isInGroup” and see if it returns any value (true or false). PS:I moved your comments to the correct article. Hi, this may seem like a simple question, but I’ve tried to use the code above with little success. I pass in what seems to be the right list guid but no matter who I log in as, it says that the user is not a member of the group (I put in alerts in the scripts). Can someone point me in the right direction as to how to get the right guid? I’m having problems getting this to work. When I run it and I try to return ui.Name from the isUserInGroup I get an error “User with ID undefined not found”. It appears that the UserID cannot find _spUserId, or anything hard coded into it. Hi I’m having problems getting this to work as well. I’ve used alerts to determine that the group membership is definately working. The script seems to work right up to the point where it needs to hide the fields. It just won’t hide them. I’ve definately used the correct FieldInternalNames. I just can’t figure out why this won’t work. I’ve also only used the default Form and haven’t customized the form. What else can I check that might stop it from actually hiding the fields? Hi, Ensure the CEWP is placed below the form. I’ve also checked that the fields aren’t set to “required”. I have it work for 2 columns and one group. But I would like to hide several columns for different groups. What do I need to only show field 'Status' to group 6, and hide it for everyone else? Note that the group id is passed as string in the $.inArray-function. Just one more question, how do I hide fields with this code for everyone outside group 3? This requires that the fields = init_fields() function is called above. I’ve tried several things, but I can’t get is to work. The column disappears for everyone. To bad, because I liked this option. I quess I did something wrong. Please update your code and see if that helps. If not, get back to me with some more details. Thank you so much. I was looking all over the web for “column permissions” and this was really easy to follow. Thanks for the change. It seems to work. Unfortunately when you upload a document directly from MS Word, you get to see the hidden field. Apparently with this way the user groups residing on sharepoint are not used when directly uploading to it. When uploading files, you enter the EditForm.aspx. It should not be any problem applying this code to this form. I would like to hide several field for different groups. 1)hide same field (4) for different groups. 2) and another 3 filed for another different groups. 3) other field for other groups. I have a problem, the function init_fields(). When I make an alert on one field , I have “undefined”. I try with a internalname of field too. same problem.. have you got a solution ? maybe its because i use script jquery 1.4.3 ? I’ve uploaded all of the scripts to my document library and changed the source links, column names and group ID in the CEWP. It’s not working though. Are you able to tell where I am messing up? Hi Alexander, Sorry — I did use the internal names by viewing the newform.aspx source. I do have another CEWP with a script on the page to hide a couple of fields. Would multiple scripts conflict? That is not unlikely. Try out one at the time to get familiar with it before combing multiple scripts. My choice field is actually a checkbox/multi-select. I saw your other post regarding on the multi-select, but I haven’t been able to piece the 2 together. Can you help with the code? I need to show 2 fields to a group if only the “DEV” option is selected. Any other combination of selections, the 2 fields need to be hidden. Thanks! You will of course have to include references to the scripts from this article to have all the “infrastructure” in place. If Red is selected AND i AM in group 96, I can see arrRed (Approval fields)… If Red is selected and I am NOT in group 96, I cannot see arrRed. That is not working with the code above. Can you help me? Sorry to bother, but I’m still stuck on this, could you help if you have some time today? Does anybody know if this works in FireFox? I’ve only had it work in IE. This has to do with Forefox not recognizing these as proper “DOM-elements”. Common solutions are to move your CEWP below your list web part and to add in alerts for debugging. I’ve read through all the older comments posted here, and I did not see anything about modifying the SharePoint alert to have equivalent permissions. From preliminary research, that does not look like it will be as elegant of a solution if it is even possible. Has anyone modified SharePoint alerts in accordance with the fields they’ve hidden on the GUI using this awesome script solution? I have checked by adding your script file and code. but i am getting like i am not in that group. even though i have checked the group id through http://doccell:1000/personal/brijeshm_shah/_layouts/people.aspx?MembershipGroupId=10 and passed 10 where my name is listed. Is there anything wrong i have done or missed ? Please it’s really urgent sir … if you have any idea.. Sorry for previous post. That is my mistake. Your code is perfect. Now i have one issue with New form. I mean Add Form there i don’t have Edit Page Option While I have that option available in List where All Items displayed in grid. But from there we have option Add Item and gives add item page there i don’t have that edit option available. Moreover can you tell me what field i should take in place of ‘OnlyForOwnerGroup1′,’OnlyForOwnerGroup2’ ? is that textbox id ? You find information on how to find the FieldInternalName of your fields there as well (the OnlyForOwnerGroup1 and OnlyForOwnerGroup2 should be FieldInternalNames). Good day to you. I trying to add in SP2010, but it is not working. The field hides all the time. IU have tried differnt groups and group IDs but I cannot not make it dynamic hide based on the group. any instruction would help. Do you get an alert with tour login name? Alert on userLoginName is showing “user with id # not found”. Basically its returning null for user id. what could be the reason? Hey Alexander, I got everything working great in terms of hiding the fields, but not coming up right on showing them for the appropriate users. When I add alerting it says my userid is a different shortname (jjflynn) even though I am signed on as bwolf. For the fun of it I added jjflynn to the usergroup and still no luck. Have you or anyone heard of something like this? See comment above regarding a new version of the script for accessing user profile information. How could I modify this script yo makes changes not on group but by created by. I need to show fields only to users who created the list item. Are you planning on updating this to work with your latest version of spjs-utility? I have put it on the list, but I have a few other scripts to update first.